Lubec  is a town in the Down East region of Maine along the coast. Lubec is the easternmost town in the United States of America. Bangor International Airport, Bangor, Phone: +1 207 947-0384, . Bar Harbor Airport, Bar Harbor, Phone: +1 207 667-7329, . Smaller and served by only one or two airlines. Roosevelt Campobello International Park, Rt. 189 to FDR Memorial Bridge to Campobello Island, Canada, Phone: (506) 752-2922, . Grounds open dawn to dusk year round. Franklin D. Roosevelt's summer island home. Administered by a commission composed of members from both the United States and Canada. The park is owned, funded, and staffed by people from both countries. The Park Commission website is an important reference. Passport required. Visit the Edmund S. Muskie Visitor Center, which contains exhibits and a video interpreting the Roosevelt story. Saturday following Victoria Day (the Saturday prior to U.S. Memorial Day) through Canadian Thanksgiving (U.S. Columbus Day) daily 10AM-6PM ADT (9AM-5PM EDT). Canadian Thanksgiving (U.S. Columbus Day) through October 31, daily 10AM-5PM ADT (9AM-4PM EDT). Tour FDR's 34-room summer home to see what it looked like when he and his family lived there. Saturday following Victoria Day (the Saturday prior to U.S. Memorial Day) through Canadian Thanksgiving (U.S. Columbus Day) daily 10AM-6PM ADT (9AM-5PM EDT). Walk through beautiful flower gardens. Enjoy a picnic lunch at Mulholland Point Lighthouse or one of the other scenic picnic areas. Hike the wooded paths and fields of the park's 2,800-acre (1,134-hectare) natural area. 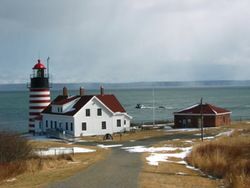 West Quoddy Lighthouse and Visitor Center, South Lubec Road, Phone: +1 207 733-2180, . Memorial Day Weekend to mid-October 10:10AM-4PM. Picturesque red-striped lighthouse is the most eastern in the US. Visitor center is housed in the 1858 lighthouse keeper's quarters. Exhibits and docents. Nice picnic area and views. Free. Le Cadeau Originals Gallery, 53 Carrying Place Cove Road, Phone: +1 207 733-2940, . June-Sept W-Su 11AM-4PM. Original weaving, knitting, local photography. Quoddy Head State Park, . May 15-October 15. Four and one-half miles of trails on over 500 acres. Forest, coastal and bog trails. Fee charged. The Mary Potterton Memorial Free Concert Series, at the Congregational Church, . Wednesdays at 7:30PM from the last Wednesday in June, through the last Wednesday in August. Cross-Country Skiing, Snowmobiling, Ice Fishing, Snowshoeing. Murphy's Village Restaurant, 122 Main Street, Phone: +1 207 733-4440. Daily year round. Cohill's Inn (Formerly the Lighthouse Inn), 7 Water Street, Phone: +1 207 733-4300. Open Year Round,  - Call for reservations. The Home Port Inn and Restaurant, 45 Main Street, Tel: 207-733-2077, Toll-free: 1-800-457-2077, . Daily. Call for reservations. Eastland Motel, 385 County Road, Phone: +1 207 733-5501, . 20 rooms. Quoddy Head Station, Toll free: 1-877-535-4714, . Vacation rentals at restored Coast Guard Station. Beautiful views from your perch on the easternmost point. Cohill's Inn (Formerly the Lighthouse Inn), 7 Water Street, Phone: +1 207 733-4300. Open Year Round, www.cohillsinn.com - Call for reservations. Bay Views Bed & Breakfast, 6 Monument Street, Phone: +1 207 733-2181. Betsy Ross Lodging, 61 Water Street, Phone: +1 207 733-8942. Six rooms. The Home Port Inn and Restaurant, 45 Main Street, Phone: +1 207 733-2077, Toll-free: 1-800-457-2077, . The Peacock House, 27 Summer St, Toll free: 1-888-305-0036, Phone: +1 207 733-2403, . This page was last edited on 31 March 2015, at 18:46.